You rely on your well for your water supply, so when it breaks, you need a dependable well repair contractor that won’t break the bank. 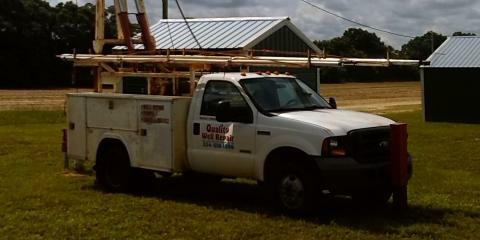 In the Midland City, AL, area, look no further than Quality Well Repair. When you work with Quality Well Repair, they bring over 25 years of industry experience to the job. Using only the highest quality equipment and industry-leading tools, their well inspection and repair specialists have become the go-to experts for local homeowners, farmers, and even poultry houses. If your sump pump or water supply system breaks in the middle of the night, they’ve still got you covered with their emergency services. You’ll have peace of mind knowing local well repair specialists are on your side any time of day or night. Whether you need help with your regular well inspection, a well drilling contractor to install a water system, or a tank replacement to keep your old system running reliably, the friendly technicians at Quality Well Repair can help. They pride themselves on providing the best well water services at the lowest possible prices. By saving money on their products and using only the most efficient methods, they can pass the savings onto customers without sacrificing quality work. Quality Well Repair is eager to help, and their well drilling contractors hope to prove themselves as worthy lifetime partners for all your well installation, repair, and maintenance needs. Call (334) 618-1696 to get started on a quote for the work you need. Check out their website or connect with them on Facebook to learn more about their dedication to honesty, integrity, and fantastic customer service for jobs both big and small.